By jumping a battery we don't mean taking a running leap over it. We are talking about when you turn your key and your car doesn't cooperate so you need a jump. It is an easy process that could get you out a jam in the future. 1. Grab your jumper cables. Having a set of cables along with other roadside necessities is a great tip for any driver. You never know when you may need them. 2. Pop the hood of your car and the hood of the car jumping you/being jumped. Make sure that neither vehicle is started. 3. Place one red clip on the Positive Terminal of the dead battery. 4. Place the second red clip on the Positive Terminal of the working vehicle. 5. Place a black clip on on the Negative Terminal of the working battery. 6. 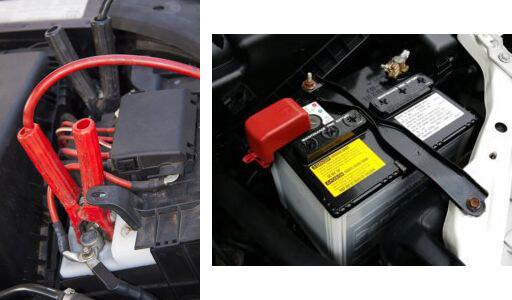 Place the final black clip on an unpainted metal surface of the dead vehicle, away from the battery. 7. Start the working vehicle and leave it running for a few minutes. This should give the dead battery enough charge to start running. 8. Start the dead car. Once started, drive it for around 20 minutes to charge the battery back up. Knowing this off-hand can save you or someone else a lot of headache. If the battery continuously requires jumping then it is time to replace it. For that, you can easily schedule a service appointment at MetroNissanMontclair.com. Metro Nissan of Montclair. Doing It Right.